"We love you great gramma"
"We love you gramma and we'll miss you." "You are forever in my heart." 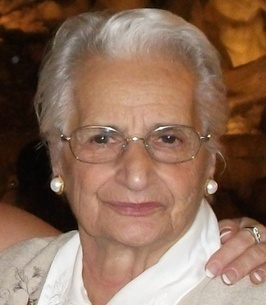 It is with great sadness that we announce the passing of our dear mother, Ann Sharp. Ann passed away peacefully at the Stayner Care Centre. She was in her 93rd year, October 10th, 1925 - October 6th, 2018. Ann always had a vision for the future and in 1953 moved to Wasaga Beach. In 1967 she and her husband John Sharp opened the Oak Lea Grocery Store and was a meeting place for cottagers for years to come. She was awarded the Business Achievement Award for 35 years in business. Ann was predeceased by her husband of 47 years John (Jack) Sharp. Her grandson Richard "Ricky" Sharp. Her parents Rosa and Constantino Cartagenise, her brothers Sonny and Raymond, and her sisters Lena, June, Marie, and Carmie. In honour of Ann's wishes, no public service will take place. Donations to a charity of your choice would be appreciated. Arrangements under the care of the Carruthers & Davidson Funeral Home. To sign Ann’s Book of Memories, please visit www.carruthersdavidson.com. To send flowers to the family of Antoinette Louise Mary "Ann" Sharp (Carteganise), please visit our Heartfelt Sympathies Store. We love you gramma and we'll miss you. We were saddened to hear of Ann's passing. We all have such fond memories of her. She was the first example of .. Strict is fair. Lots of funny conversations with her as well. All the neighbourhood kids loved going to her store, and our little gang called her the "great guru" because she wore her famous turban on her head. Like her name, she was always sharp. Our thoughts are with her family, so lucky they were to have her. Mary and Dave Holmlund, and Brook and Ben. Penny, Rod and families...I'm very sorry to hear about your Mom. She was a much loved part of our neighbourhood around 'the loop'. Sincerely...Kim Deshaies.